You want your computer systems to be simple, reliable and automatic. Script Debugger is the integrated development environment that makes that happen by making your AppleScript coding easier, faster, and more transparent. And now, for the first time, it is available in a free “lite” mode that offers you a taste of the full power of Script Debugger. Before you begin scripting, discover the information and commands that your applications offer. Use the Explorer to experiment with applications, explore their data and manipulate it to see how the application responds. This power is not limited to a specific screen. When you create and debug your script, the Explorer remains available and continues to show data information as you work. Maximize your productivity and write scripts easily and quickly with Script Debugger’s powerful and flexible code creation features. Insert tell blocks for applications and objects or properties. Script Debugger helps you by intelligently inserting a broad range of commonly-used code segments. These features are specifically designed for the peculiarities of the AppleScript language. They let you easily navigate large scripts, automatically enter “end” lines and closing delimiters, and more. As you create, test your scripts to make sure they behave as expected. Script Debugger can run a script in an analytical mode that tracks your variables and their values, making it easy to isolate and fix specific problems when things go wrong. Watch your script as it runs, line by line, viewing the values of variables at every stage of the script’s execution. Use breakpoints to pause your code at key points. With Script Debugger, you never have to guess about what is happening as your script runs. Easily package scripts for your clients and colleagues. Script Debugger checks for common errors when packaging scripts, and it makes distributing scripts to others amazingly simple. Should your script contain sensitive or private information, you can export it in “run only” form to prevent others from accessing the code. Script Debugger anticipates problems by telling you instantly what applications, scripting additions, libraries and frameworks are needed in order to run your script successfully. First introduced by Apple in 1992, AppleScript is a venerable and proven scripting language for automating tasks on the Macintosh. It uses terminology that is similar to common English words, and it is relatively easy to learn in comparison to other scripting languages. But it is also an object-oriented language that is fully capable of handling complex programming tasks when necessary. AppleScript creates script files that can control your computer and its various applications. It can be used to automate repetitive and error-prone manual tasks, saving both time and money. For example, it can automatically retrieve files from remote servers or schedule and execute important updates. Its broad range of possible uses makes it a powerful tool for both individuals and businesses in search of optimized workflows. 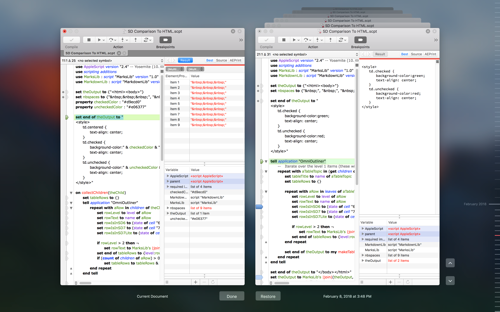 Script Debugger is an integrated development environment focused entirely on AppleScript. This focus allows it to deliver a suite of tools that make AppleScript development amazingly productive. You can use it to write and edit code, analyze target applications, debug scripts, and more. The Dictionary Explorer lets you see directly into the live data within any scriptable application. Unlike Apple’s Script Editor, you don’t have to imagine how to convert a written description of an application’s scripting interface into code. Script Debugger shows it to you visually and lets you interact with the application without having to write a line of AppleScript. The best way to see what your script is doing and to find bugs quickly. Execute scripts line-by-line to see exactly how they are executing. Set breakpoints to pause a script at key points. No more Caveman Debugging with AppleScript `log` statements. Script Debugger shows you the result of each and every statement as you go and the value of every variable in your script. There is no better way to see exactly what your code is doing. Script Debugger provides an amazingly helpful set of code completion tools. They include completion of variable names in your script, AppleScript and Scripting Addition commands, as well as application commands and names. Script Debugger also provides completions for AppleScriptObjC handlers which are tedious and error prone to type by handle. If you use AppleScriptObjC, Script Debugger shows you the details of the Objective-C values your script is using. Unlike Apple’s Script Editor, where you see «class ocid» id «data optr0000000080100F0000600000» and wonder what this value might be, Script Debugger identifies an array with five elements, and shows the value of each array element. Script Debugger can easily find the script you want to work with. The Open Quickly command lets you find scripts targeting specific applications, documents or even scripts containing a particular variable or handler name. You don’t even have to know the full name of the thing you are looking for. Start typing and Script Debugger will offer you the most relevant search hits it can find. Work with long scripts easily. Split-pane editing allows you to view two or more sections of your script at the same time. Code Folding lets you collapse portions of your code to help you focus on your work. Use the Dictionary Explorer to find the application objects you need, and then use drag & drop to add automatically generated AppleScript code to your script. Combine this with all of Script Debugger’s other code building tools, including the Tell Block builder, to save enormous amounts of time and avoid errors. 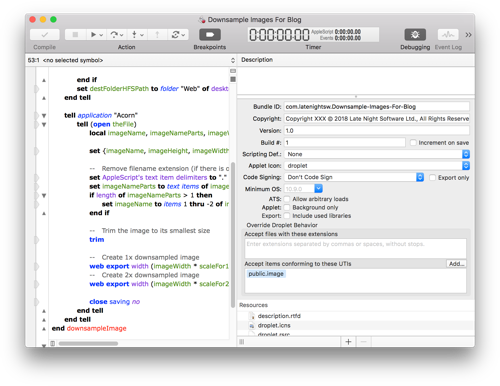 Script Debugger offers facilities to report common AppleScript and deployment errors. For instance, the Leaks feature detects when a script opens and does not close a file, or when a database transaction begins and is not finished. Script Debugger watches for common errors like saving a script with an idle handler without enabling the Stay Open setting. Script Debugger provides virtually endless opportunities for customization. Create your own script templates. Generate clippings to insert commonly used blocks of code. Clippings can employ markup to insert parameters and speed editing. Create AppleScript scripts to automate repetitive tasks. Assign keyboard shortcuts to your clippings, scripts and any Script Debugger menu command. Who is Script Debugger For? Script Debugger is for any individual or organization that uses a Macintosh and wants to automate routine tasks. The possibilities are vast. Almost any routine software function that you have staff carrying out manually can be automated to save time and money and reduce errors. Script Debugger makes the coding process faster and frees you up to think creatively about new ways to use AppleScript to make your life easier and more productive. The biggest change in Script Developer 7 is the release of our new “lite” mode, which offers all the basic editing, debugging and dictionary functions that you need to write your code. Even without Script Debugger’s advanced features, it represents a significant improvement over the Script Editor which comes with your Macintosh. 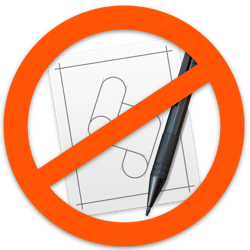 We see Script Debugger Lite as the best free option available for working with AppleScript. Review and open past versions of a script from the Mac OS X document version history provided both locally and via Time Machine backups. Execute different versions of your script right from the Versions browser before deciding to revert to a particular version of your script. If you are upgrading from Script Debugger 5 or 6, you’ll be able to take advantage of this feature immediately with you existing scripts because past versions of Script Debugger have been retaining version information for you. Script Debugger 7’s improved bundle editor lets you specify the types of files your AppleScript droplets accept. Specify files either by Uniform Type Identifier or by filename extension, or both. Script Debugger 7 offers more options for configuring AppleScript applets and droplets. Control App Transport Security, make background only applets, and bundle required libraries directly from Script Debugger. Script Debugger 7 offers a new way of deploying AppleScripts as standalone applications with an improved interface for your users, support for automatic software updates via Sparkle and much more. If you are creating AppleScript droplets, Script Debugger 7’s enhanced applets provide a drop target window where users can drag & drop files or use Spotlight searching to find the files they want to process. Script Debugger 7’s Dictionary Explorer lets you move, copy or delete objects. Script Debugger 7’s lets you explore much more of an application’s scripting abilities without writing a single line of AppleScript code. Delete an object by selecting it in the Explorer and pressing the delete key. Move and copy objects using drag & drop within the Explorer.